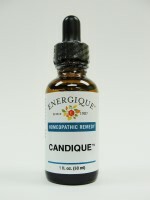 Candidiasis can be stopped by a change in diet and help from natural remedies such as Energique's Candique Homeopathic Remedy containing Candida Albicans 30c, demineralized water, and energized water. Suggested Use: Adults, take five (5) drops orally three times daily; children (under 12 years), take two (2) drops orally twice daily or as directed by a health care professional. Candida Albicans is a form of yeast found in the body and is most often the culprit of yeast infections. When the Candida level is low and the body is healthy, the yeast is naturally controlled by the work of friendly bacteria. In the intestinal tract, Lactobacillus acidophilus and Bifidobacteria bifidum bacteria normally keep things under control. However, if the immune system is compromised or the body is in a weakened condition, the yeast could multiply significantly. This proliferation of Candida is referred to as Candidiasis, or yeast infection, and its effects can be widespread and potentially serious. Candidiasis can be present as the well-known vaginal yeast infection, as thrush (in the mouth causing white patches), and as esophagitis (when thrush descends into the esophagus).